Nobel Laureate Ebadi Looks at Iran's Contradictions Shirin Ebadi, author of Iran Awakening and winner of the 2003 Nobel Peace Prize, discusses the standoff over Iran's nuclear program and the rhetoric of President Mahmoud Ahmadinejad. She also explains why she decided not to leave her homeland. 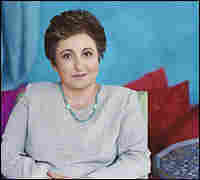 Shirin Ebadi, Iranian human-rights activist and winner of the 2003 Nobel Peace Prize, talks to Robert Siegel about the international standoff over Iran's nuclear program and the provocative rhetoric of Iranian President Mahmoud Ahmadinejad. Ebadi, author of Iran Awakening: A Memoir of Revolution and Hope, also discusses the state of human rights in her homeland and why she decided not to leave it. She says it's important for Iranian expatriates to familiarize themselves with Iran today -- and understand that it is a "land of contradictions." My indulgent grandmother, who never spoke to us children in anything but honeyed tones of endearment, snapped at us for the first time on August 19, 1953. We were playing in the corner of the shadowed, lantern-lit living room when she turned on us with a stern expression and scolded us quiet. It was the year before I started grade school, and my family was spending the summer at my father's spacious country home on the outskirts of Hamedan, a province in central western Iran where both of my parents were raised. My grandmother also owned property nearby, and the grandchildren gathered there each summer, playing hide-and-seek in the fruit orchards and returning by sunset to gather around the radio with the adults. I vividly recall that evening: we returned home with sticky fingers and berry-stained clothes to find the adults in a terrible mood, for once unmoved by our disarray. They sat huddled around the radio, closer than usual, with rapt expressions, the copper bowls of dates and pistachios before them untouched. A trembling voice announced on the battery-operated radio that after four days of turmoil in Tehran, Prime Minister Mohammad Mossadegh had been toppled in a coup d'etat. To us children, this news meant nothing. We giggled at the downcast eyes and somber faces of the adults and scampered away from the still, funereal living room. The supporters of the shah who seized the national radio network announced that with the fall of Mossadegh the Iranian people had triumphed. Few outside those paid to participate in the coup d'etat actually shared this sentiment. For secular and religious Iranians, working class and wealthy alike, Mossadegh was far more than a popular statesman. To them, he was a beloved nationalist hero, a figure worthy of their zealous veneration, a leader fit to guide their great civilization, with its more than twenty-five hundred years of recorded history. Two years prior, in 1951, the prime minister had nationalized Iran's oil industry, until then effectively controlled by Western oil consortiums, who extracted and exported vast stores of Iranian oil under agreements that allotted Iran only a slim share of the profits. This bold move, which upset the West's calculations in the oil-rich Middle East, earned Mossadegh the eternal adoration of Iranians, who viewed him as the father figure of Iranian independence, much as Mahatma Gandhi was revered in India for freeing his nation from the British Empire. Democratically elected to power by overwhelming consensus in 1951, Mossadegh extended his popularity beyond the appeal of his nationalism. His open demands for freedom of the press, his penchant for conducting diplomacy from his bed, his Swiss education, and his Iranian savvy combined to enchant people, who saw in him a brilliant, cunning leader who embodied not just their aspirations but their intricate conception of self -- like them, he was composed of seeming contradictions, aristocratic roots and populist ambitions, secular sensibilities that never precluded alliances with powerful clerics. The Iranian constitution of 1906, which established the modern constitutional monarchy, vested only symbolic power in the hands of the monarchy. Under the reign of Reza Shah, from 1926 to 1941, a wise dictator and nation builder who assumed total authority with a measure of popular support, the monarchy ran the country. But in 1941, after British and Russian forces occupied Iran during World War II, Reza Shah was forced to abdicate the throne in favor of his son, Mohammad Reza Pahlavi. The young shah presided over a period of relative political openness marked by a freer press, the balance of power shifted back toward elected government, with the parliament and its appointed prime minister taking control of the country's affairs as the constitution had intended. During Prime Minister Mossadegh's brief era, the shah exerted nominal influence, and until the coup d'état of 1953, it could be said the Iranian people were effectively governed by their elected representatives. In 1951, next to the prime minister, the unloved thirty-two-year-old shah, heir to a newly minted, unpopular dynasty conceived of by a Persian Cossack army officer, appeared a green inferiority of little promise. The shah observed Mossadegh's rise with anxiety. In the expansive popular support for the prime minister, he confronted his own vulnerability as an unpopular monarch backed only by his generals, the United States, and Britain. The two Western powers were incensed by Mossadegh's nationalization of Iranian oil, but they bided their time before launching a response. In 1953, they concluded that circumstances were auspicious for his overthrow. Kermit Roosevelt, a grandson of Teddy Roosevelt, arrived in Tehran to reassure the skittish shah and direct the coup d'etat. With nearly a million dollars at his disposal, he paid crowds in poor south Tehran to march in protest and bribed newspaper editors to run spurious headlines of swelling anti-Mossadegh discontent. In a neat four days, the ailing, adored prime minister was hiding in a cellar and the venal young shah was restored to power, famously thanking Kermit Roosevelt: "I owe my throne to God, my people, my army, and to you." It was a profoundly humiliating moment for Iranians, who watched the United States intervene in their politics as if their country were some annexed backwater, its leader to be installed or deposed at the whim of an American president and his CIA advisers. The shah ordered a military trial for Mossadegh, and newspapers ran front-page photos of the fallen prime minister entering the crowded courtroom, his gaunt frame and aquiline features more striking than ever. The judge handed down a death sentence but said he would reduce it to three years in prison, in tribute to the shah's superior mercy. For those three years, Mossadegh languished in a central Tehran prison; afterward, he retired to his village of Ahmadabad, to spend his retirement responding to letters from his devastated and still loyal supporters. In later years, his replies, penned in his subtle, lucid handwriting, appeared framed in the offices of Iran's leading opposition figures, those who would a quarter century later thrust the shah from power in the 1979 revolution. Twelve years before the coup that interrupted both Iranian history and their lives, my parents met and married in the fashion typical for Iranians of their generation: through the traditional courtship ritual known as khastegari. On a bright spring afternoon in 1945, with the cool mountain breeze blowing across the ancient city of Hamadan, my father presented himself at my mother's family home to ask for her hand in marriage. They were distant relatives, and had met several months earlier at the home of a second cousin. The family received him in the formal sitting room reserved for company, and my mother served tea and shirini (the word means "sweets," and shares an origin with my name), peeking at my father's handsome profile while carefully pouring the cardamom-laced tea in the graceful manner long practiced for precisely this occasion. He fell deeply in love with her from the start, and to this day I have yet to see a man adore a woman more devotedly than he did my mother. Throughout their long lives, he addressed her reverentially as Minu khanum, adding the formal Persian word for "lady" after her name, as though he feared familiarity would diminish his regard. She called him Mohammad-Ali Khan. When my mother was growing up, she dreamed of attending medical school and becoming a doctor. But before the day of the khastegari, the family roundly dismissed this possibility, on grounds that my mother scarcely had control over. As she entered adolescence, it escaped no one's notice that she was becoming a rather spectacular beauty. Had she been born a generation earlier, when it was unheard of for women to attend college, her luminous, fair skin and slender figure might have conferred some advantage in the only realm in which she could compete, the marriage bazaar. But for a young woman born in the late 1920s, a time when patriarchy was slowly loosening its grip on Iranian society and a few women were being admitted into universities, her good looks were a liability to any ambition greater than marriage. She did not wear the veil, for her family was not so traditional as to insist that its girls cover their hair. But she did witness the banning of the hejab, as part of the modernization campaign launched by Reza Shah, who crowned himself king of Iran in 1926. Turning an expansive country of villages and peasants overnight into a centralized nation with railroads and a legal code was a complex task. Reza Shah believed it would be impossible without the participation of the country's women, and he set about emancipating them by banning the veil, the symbol of tradition's yoke. Reza Shah was the first, but not the last, Iranian ruler to act out a political agenda -- secular modernization, shrinking the clergy's influence -- on the frontier of women's bodies. Circumstance and era conspired to keep my mother from a university education, but at least she ended up marrying a man as unpatriarchal as could be imagined, for his time. My father was serene by temperament, controlled his anger without fail, and could never be provoked into raising his voice. When upset or irritated, he paced the house with his hands behind him or methodically rolled a cigar, extracting tobacco from a silver case carefully, using the time to still his mind and raising his head only when he was fully composed. He was born into a wealthy family, to a landowning father who served as a colonel in the military, in the late days of the Qajar dynasty, the monarchy that preceded Reza Shah's. My grandfather married a Qajar princess whom he loved dearly, but who could not bear him children. After painful years of trying, he finally relented to the insistence of his brothers and, with his wife's approval, acquired a second wife, Shahrbanu, who gave birth to my father and uncle. My grandfather passed away when my father was seven, leaving Shahrbanu alone with two children. The relatives fought over his will and eventually stripped the widowed Shahrbanu of much of his property and wealth. Indignant, she decided to fight back. She traveled to Qom, Iran's holiest city and home to the country's seminaries, hoping to find clerics who would help her secure custody of her children and the holdings that remained. With their assistance, she managed to keep her two sons, as well as assets enough to meet the family's basic needs. In those days, women's consciousness of their rights was limited to their intuitive sense of right and wrong; they would not have conceived of petitioning a legal system for redress, and instead appealed to influential men in society -- often clerics, seen as a resource for battling injustices large and small -- to advocate on their behalf. I was born on June 21, 1947, the summer before we left Hamedan for Tehran. My childhood memories revolve around our home in the capital, on what was then called Shah Street (renamed, like most of the city's street, after the Islamic Revolution). The house was quite large, two stories tall and full of rooms, a veritable playground for my siblings and me. In the manner of old Iranian homes, it was built around a central courtyard garden full of roses and white lilies. There was a pool in the middle where a few silvery fish swam, and on summer evenings our beds were carried outside, so that we could fall asleep under the stars, the air perfumed with flowers and the night's silence filled with the chirping of crickets. My mother kept the house spotless -- clutter of any sort irritated her -- and in this she was assisted by our household staff. Many of my father's farmworkers from Hamedan had applied to serve at our house in Tehran. She entrusted each servant with a task; one did the shopping, another cooked, the third cleaned, and the fourth served tea and meals to guests. My mother seemed to genuinely love my father, though their marriage had been essentially arranged, and had kept her from attending college. She would wait impatiently for his deep, booming voice to resound through the courtyard at the day's end. But after her marriage, she developed an extraordinarily anxious temperament. If we came home five minutes late, we would find her in the alley outside our house, frantic with fear that we had been kidnapped or run over by a car. The nervousness manifested itself in her physical health as well, and she was often ill, in and out of the care of doctors unable to fully treat or diagnose the source of her constant agitation. There was no obvious reason for it. By almost any account, she was a perfectly fortunate woman -- cared for by an ideal, loving husband, mother to obedient, healthy children, in relatively good social and financial standing. It would have been enough to make most Iranian women of her day content. But I can't recall a single day when my mother seemed truly happy. As I grew older, my mother still groomed herself immaculately, still smiled quietly as she sat knitting in the shadiest corner of our spotless house, but the anxieties still raged inside her, and her body revolted with one illness after another. She was perpetually sick, and her attention to her failing health only fed her nervousness. For a while she came down with asthma, and she paced the house, complaining of feeling suffocated. When I was fourteen, my older sister married and moved back to Hamedan, leaving me the eldest child at home. My mother's poor health was the backdrop of our lives, and I constantly feared her death. I would lie awake at night, staring at the ceiling through the gauze of mosquito netting, worrying about my brother and sisters. What would happen to them if our mother died? Each night, I entreated God to keep her alive until my little brother and sister grew up. In my young mind, I thought that if she died I would have to quit school and take on her duties at home. One day that year I crept up to the attic, to make a quiet appeal to God. Please, please keep my mother alive, I prayed, so I can stay in school. Suddenly, an indescribable feeling overtook me, starting in my stomach and spreading to my fingertips. In that stirring, I felt as though God was answering me. My sadness evaporated, and a strange euphoria shot through my heart. Since that moment, my faith in God has been unshakable. Before that day I had only said my prayers by rote, because I had been taught to say them, just I had been taught to wash my face before bed. But after that moment in the attic, I began to recite them with true belief. It is hard to describe the awakening of spirituality, just as it is difficult to explain to someone who has never fallen in love the emotional contours of that experience. My attic revelation reminds me of a line from a Persian poem, "Oh you, the stricken one / Love comes to you, it is not learned." 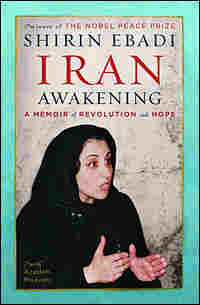 Excerpted from Iran Awakening by Shirin Ebadi with Azadeh Moaveni. Copyright (c) 2006 by Shirin Ebadi. Excerpted by permission of Random House, a division of Random House, Inc. All rights reserved. No part of this excerpt may be reproduced or reprinted without permission in writing from the publisher.